It was a fantastic weekend to be back in Vancouver for Voices in the Park to install at two locations for Sarah Mclachlan. The weather was perfect, the atmosphere both relaxed and stirring and the music a real treat. The line up for the largest concert to take place in Stanley Park included Sarah McLachlan, Stevie Nicks, Bryan Adams, Jann Arden, Hedley, and a special guest appearance by Sarah’s long time friend, former president Bill Clinton. Clinton told the audience “Music taught me discipline and creativity. It made me see the world in different ways. It made me understand things in different ways,” and “You are literally, by contributing here, increasing the capacity of young Canadians to learn and grow, to live their dreams.” The concert was in support of the Sarah McLachlan Music Foundation, which provides free music training and programs for socially challenged and at risk Vancouver youth. Raj Tents’ co-founder, Maurice Walsh, created a cool blue vibe for the VIP sponsor tents at Stanley park with dove egg and celeste blue striped walls, lapis blue arches for guests to enter through, aqua toned drapes and ornate matching scalloping. Sarah hosted a party at her lovely home the day after the concert where she and her friends shared a more intimate musical experience with a select audience. Sarah wanted to explore a Bohemian Chic, Gypsy theme and Maurice designed the tenting and décor on a base of ivory with gold, orange and red accents. Directly adjoining the house, a 40’ wide frame housed an ivory lining with gold star print, matching scalloping valance, drapes and hanging lamps. In one corner, a Pergola tent enclosed the small stage and Raj Tents' lounge furniture in spicy orange and gold together with standing lamps provided seating for guests. Towards the back of her garden a 30’ x 50’ tent in the same color way offered an alternative space and housed the bar and food service. Bringing in some stronger colors to spice things up, both the outside bar and entrance tents were in bright reds and spicy orange. Many thanks to Brand Live, who produced the event and a special ‘Thank You’ to Joe Dobosh, who led the installation, and his main crew Hector and Anthony, all from our Los Angeles office. Destination Events have little margin for the unforeseen, so it is a reason for congratulations when all goes so well! 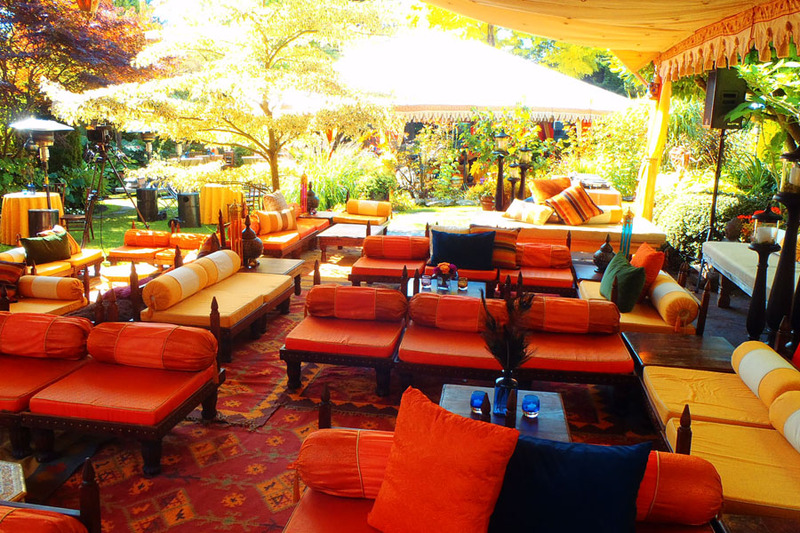 Raj Tents is a luxury tenting and decor rental company serving the US and abroad. We specialize in themeatic luxury tenting for classic weddings, Indian weddings, corporate events, social gatherings, and film & TV set design. How can we help you? Let us know! We will reply as soon as possible. In the mean time, have a look around our website, check out our blog, visit us on Facebook, see us at Instagram, follow us on Twitter, or check us out on Pinterest. All content is copyright © 2019 Raj Tents - All rights reserved. Reproduction of images or content is strictly prohibited. Contact us for permission to use any of our content.